We now live in a world where we rely on technology, and therefore power, more and more. As we approach winter, the adverse weather conditions can hamper our power supply, making it more unreliable. If the power goes out it can have a massive impact on our lives. So how can you look after your power in these adverse conditions? The answer is with a backup generator. At The Hampshire Generator and UPS Company, we have plenty of backup generators for sale to ensure you are never without power. Despite the generator not being your primary source of power, it doesn’t mean you should opt for the cheapest generators for sale. A backup generator needs to perform when you need it most. Choose a well-known brand assured for their quality and reliability such as Excel Power Generators, Hyundai Power Equipment or Pramac generators. Used diesel generators can be an ideal choice for backup power, however, make sure the generator receives regular servicing and maintenance so that it remains in the best condition. At The Hampshire Generator and UPS Company we offer used generators for sale and provide generator servicing and generator repair too. It is best to work out what your must-have appliances are that you will need to power in the event of a power shortage. With a backup generator, it may not be possible to power your whole house, especially if you have a budget in mind. However, do check the power consumption of your key products and make sure you buy a generator that can cope. If it is a generator for commercial or industrial use then you will more likely need to cover the entire site – we can assist with correctly sizing the unit. For backup purposes, a diesel generator may be the best choice. It is likely you will only use your diesel generator sporadically. This means fuel will be left to sit in the tank until the next use. As a general rule, petrol can go stale in a very short space of time which is a waste of fuel. A diesel generator for sale will mean the fuel lasts longer. Typically, diesel is more cost-effective than petrol too. When searching for generators for sale, it may be worthwhile extending your search into the additional items and extras for an automatic transfer switch (ATS). An automatic transfer switch can save time and stress in the event of a blackout. Without an ATS, it will be up to the user to switch the generator on. They will then have to wait until the generator is up to speed and then apply loads to the generator manually. With an automatic transfer switch, all of this is taken care of for you. Automatic systems are more expensive but can prove invaluable, especially during power cuts in the middle of the night. Get the Professionals to Help! Installing a backup diesel generator is not a DIY task and you should seek professional advice. There are many rules and regulations in place to keep you, your family and national grid workers safe when there is a power cut. Never back-feed your electrical circuit and ensure the mains grid is completely isolated before a generator is connected. If you are looking for a backup generator for your home or workplace, then get in touch with our team for free, friendly advice. 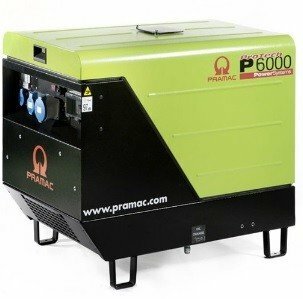 Whether you are choosing between a Pramac generator, a Hyundai generator or and Excel Power Generator or just not sure what power you need, our team is ready to help.